Bacarro is a very correct, well built gelding with a beautiful head and three fantastic gaits. His sire, Bonheur is by Brentano II. Bonheur absolved his stallion licensing test in Adelheidsdorf in 1996, achieving a top evaluation in rideability index. He received a 9 for his walk and an 8 for his trot and canter, also receiving 8's for his character and temperament. Bonheur won the Championship Stallion Show in Griesbeek, Holland in 1997 against very important competition, most of whom where 5 and 6 year olds. Bonheur qualified for the Bundeschampionat in 1998 as a five year old. As a six year old, he won the prestigious Nobilis Cup in Bremen, Germany. 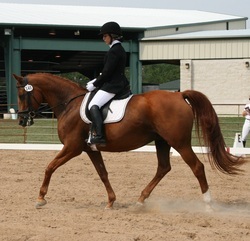 He has won numerous dressage shows in "S" Level, primarily in Holland since his previous owner lives close to Holland. His offspring are very elegant with tremendous rideability. They have shown high performance ability in dressage, bringing Bonheur's "Breeding Value" in dressage to the top 10% in Germany with an overall 150 points. In 2010 Bonheur was listed in the Stallion Yearbook (FN) in Germany with an overall score of 134. Atlanta is an elite imported Hanoverian Mare by Akatschi and out of a Dynamo mare. This handsome horse should excel in any discipline. Should mature to around 16.2. Bacarro had a great first year showing under saddle. He scored to 72% at training level and began showing 1st level. He is currently schooling all the 2nd level movements. He was started by a young rider and is currently in professional dressage training. 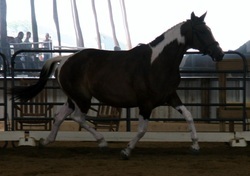 Wonderful temperament with expressive gaits. Easy to sit and nice in the bridle. Bacarro would make a great competitive horse for an amateur or junior rider. Talented enough for a pro. FEI Prospect!! Price will increase with training/show experience. This young colt boasts incredible bloodlines, correct conformation and great movement. Sire, Sonntagskind is a Sandro Hit/Donnerhall/Rubinstein stallion that won the 2009 North American 30 day Stallion Test and was Reserve Champion of the 2009 North American 70 Day Stallion Test. Atlanta is an Elite Imported Hanoverian Mare by Akatschi and out of a Dynamo mare. This is a very athletic horse with dynamic movement that should be able to excel in any discipline. 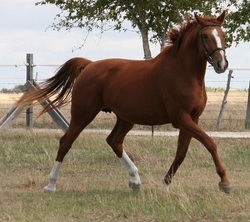 Gloriana has beautiful, floating movement and should excel as a hunter or dressage horse. She is a big filly and will probably mature close to 17 hands. Louie is a beautiful, super uphill gelding with lovely gaits. He has had jumper training most of his life and is just beginning his dressage career. He is currently showing training level and schooling 1st/2nd level at home. Louie is very sensitive and requires and experienced, tactful rider. Congrats to Louie's new owner, Jessica Springer! Three fantastic gaits, very athletic. Congrats to Gran Diva's new owner, Dr. Emily Collins DVM!! 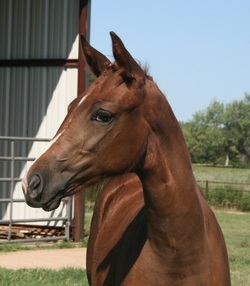 Congratulations to Amy Spencer of Mexico on the purchase of Atlanta and her 2012 Gran Casso foal! Congratulations to Joy Alexander of Georgetown, TX on the purchase of this beautiful mare! Reigner has registration papers with the RPSI and is a main mare book RPSI mare. She was recently added to the main mare book of the ISR/OLD with 101.5 points. She produced a beautiful, leggy filly by Gran Casso in 2010. This mare has a fabulous temperament and three very nice gaits. Her foals should all be very athletic and tall with good bone. Congrats to Cathy Sleeper, the new owner of Reigner!